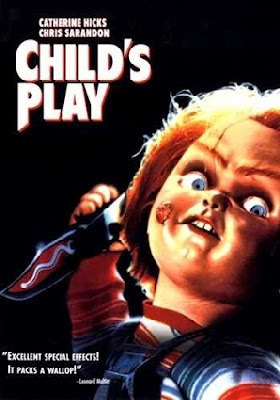 The Rockport Film Review: Evil Doll Movies #2 - "Child's Play" Enter Chucky!! Evil Doll Movies #2 - "Child's Play" Enter Chucky!! The Child’s Play franchise with the loveably insane Chucky doll has become a pop culture icon. With five films and more to come, it hasn’t quite reached the legendary status of Jason, Freddy, and Michael Myers, but Chucky continues to slash his way to the top. Tom Holland directed the original 1988 film as well as the Stephen King adaptations of “The Langoliers” and “Thinner”. Set in Chicago this is the story of a widowed mother (Catherine Hicks) and her son Andy (Alex Vincent). Andy is having a birthday and wants a “Good Guy” doll. It’s kind of like the boys version of a Cabbage Patch Kid. His mother buys one from a street peddler and Andy couldn’t be happier. Little do they know that the doll is inhabited by the soul of a serial killer the lakeside strangler Charles Lee Ray. Chucky talks to Andy, but when things start to happen and he blames the doll. Obviously, nobody believes him, even his mother. Chucky is pure satanic evil with a dirty mouth to match. Like Freddy Krueger, he has a string funny one-liner that goes to embarrassingly bad lengths in the later sequels. Chris Sarandon plays a detective investigating the mysterious murders and is finally convinced that Chucky is to blame. But who will believe him? This movie also has several of the now more familiar horror clichés. The fake scare followed by the real one, Chucky comes back to life about three times, nobody believes the little kid. The doll effects are pretty good, and Chucky seems to be acting circles around Sarandon’s character. All in all the acting is quite good as well as the production values. This is another classic essential 80’s horror movie. What a decade!